Samsung only started selling their first smartwatch some 4 months ago, and it seems they're already making plans to replace it. Following several leaks over the past week, Samsung officially announced a couple new smartwatches. The Samsung Gear 2 and Gear 2 Neo look to be rather different replacements for the Samsung Galaxy Gear; they'll be running Samsung's own Tizen OS and not Android, and early signs suggest that Samsung put more thought into the new smartwatches than they put into the original Galaxy Gear. Both watches are built around a 1.63" Super AMOLED screen (320 x 320 resolution), and for the most part they have the same guts as well. They run Tizen on a dual-core 1GHz with 512MB RAM and 4GB Flash storage. That's a faster CPU than on the original Galaxy Gear, anf the new devices are also fractionally smaller and lighter than their predecessor. And that's not the only way that the new models improve upon the old. The new smartwatches look to be more than just a smartphone accessory; Samsung is also taking on exercise wearables. In addition to the expected Bluetooth, the Gear 2 smartwatches also have a pedometer, a heart rate sensor, and an IR port. And according to the spec sheet, this last will enable the Gear 2 to act as a remote control for household gadgets. 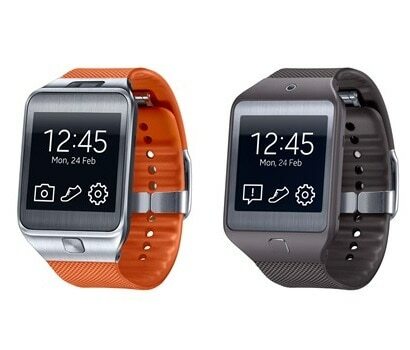 Just about the only way these 2 smartwatches differ is that the Gear 2 weighs a few grams more; it packs in a 2MP camera. One watch is also slightly taller, while the other is slightly wider. The new watches will retain the same basic functionality of the old watch, and they're also getting new apps. Among the first apps will be software from BMW, CNN, Garmin, Line, and Path. By packing more abilities into a smaller space Samsung should be able to create a product that will justify the $300 price tag of the original, which at the time was rather overpriced given the limited functionality. I don't see any details on price, but Samsung is expecting ship the new Gear smartwatches in April. This is why the world needs Apple (at least the Jobs version). Otherwise “smartwatch” means we get a dual-core 1984 Casio. BTW, I’ve been seriously considering buying one of those Casio relics off of Ebay and reviewing it in comparison to the 2013 models. I think it might come out ahead.